Facebook Video Advertising Hoax Spreads Again! Though Facebook is actually considering adding video ads to users’ News Feeds, a hoax message purporting to be from Mark Zuckerberg is spreading across Facebook that claims that these ads will radically change user experience on the site. “We are currently looking into playing video ads as a way to increase the profitability of Facebook,” the fake Zuckerberg message reads. “These ads will stop what you are doing every ten minutes and play for anywhere from 15 to 60 seconds. 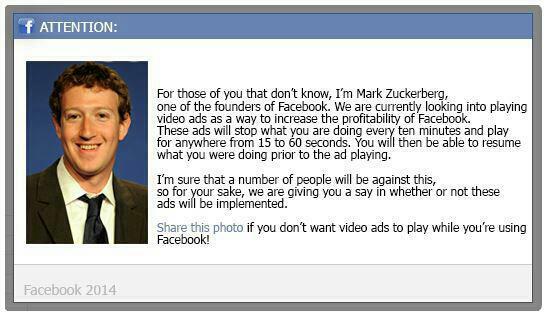 You will then be able to resume what you were doing prior to the ad playing.” The hoax message then goes on to say that users should share this message (with a photo of Zuck) if they don’t want Facebook to implement video advertising. The reason scams like this work is simple: they combine people’s fears about Facebook with a grain of actual news. While Facebook is considering video ads, it would never introduce a product that would halt users from using the site for any length of time. Even if they did want to implement video ads, they wouldn’t send out a survey asking users for their opinion. 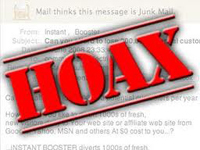 This scam is one of the more realistic ones that’s been distributed lately, though upon any close level of examination, it’s still an obvious a hoax.